Bryan Young, owner of OC Deck & Patio, is committed to bringing an enjoyable experience to all his clients. On both projects we visited, Bryan masterfully crafted decks from our hardwoods to exceed his clients’ expectations. OC Deck & Patio specializes in building custom-designed decks and patio covers. Each project is engineered using only the highest quality materials and workmanship. We stay up-to-date with all of the latest decking and railing products to provide you the deck or patio you’ve dreamed of. We’ll come to you with samples of different decking options and discuss with you the benefits of each product as well as answer any questions you may have about the construction process. In San Clemente, a homeowner had an old deck overlooking the hillside. Bryan suggested using natural hardwoods since they blended in with the Zen-like features of the backyard. The end result is a beautiful Tigerwood deck with glass railings and light fixtures that is more like an extension of the house than an outdoor deck. In Laguna Beach, Bryan worked his magic once more. The house had an underground garage whose roof served as a small patio. This patio was just a membrane covered in a dull sheet that people walked on without causing damage. Bryan suggested using Advantage Deck Tiles to create an attractive surface that would complement the beauty of their home and invite guests to enjoy the lovely view of the ocean. OC Deck & Patio services all of Orange County and parts of northern San Diego County. For more information you can visit their website at ocdeckpatio.com or call at 760-828-2615. I really like the deck pictured, especially the color. 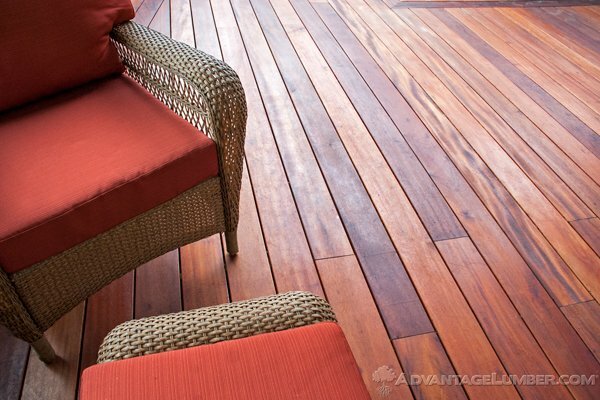 The cherry color really matches the padding on the chairs as well, which adds to the vibrant nature of the whole deck. My wife and I were thinking we would do this color when we build a deck in our backyard, and our house is a dark brick color too; should look really nice!